This strongly anti-oxidant jelly fungus can benefit complaints like sore throats and inflamed mucous membranes from colds. It also helps protect the heart and reduce cholesterol. Both A. auricula and A. polytricha are considered as species of Mu Er in Chinese medicine and today are used interchangeably. 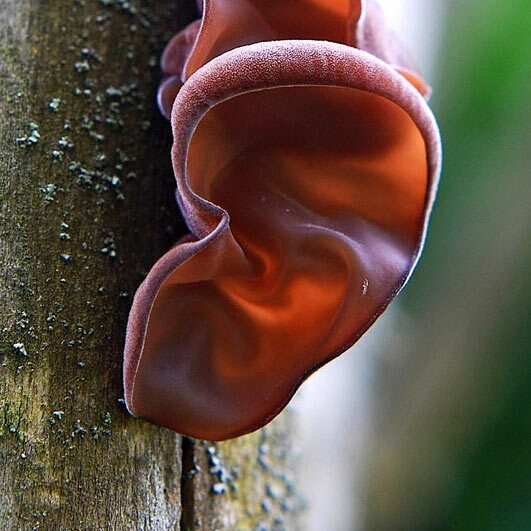 It is a jelly fungus which often resembles an ear; originally known as Judas's ear, the name has become shortened over many years to be known as the "Jews' Ear" fungus in English. This interesting fungus has had its traditional benefits become better known to the West in recent years; mainly its positive effects on the mucous membranes of the nose and throat, making it particularly beneficial when suffering the effects of a cough, cold or flu-like virus - especially one with a runny nose! In common with other jelly fungi, Auricularia Auricula fruiting bodies contain high levels of polysaccharides and these are the main bioactive component, although phenols have also been shown to contribute to the total antioxidant capacity. The Wood Ear has a number of interesting proven health benefits. Anti-inflammatory effects Auricularia Auricula polysaccharides have anti-inflammatory activity, which correlates with its traditional use for soothing irritated or inflamed mucous membranes. Anti-oxidant - Auricularia Auricula extracts show strong anti-oxidant properties with a positive correlation between levels of phenols and anti-oxidant capacity. Anti-thromobotic efects Polysaccharide extracts inhibit platelet aggregation and increase clotting times both in-vitro (in the test-tube) and in-vivo (in the organism). Its anticoagulant activity was due to catalysis of thrombin inhibition by antithrombin. Anti-cholesterol Auricularia Auricula polysaccharides have been shown to lower blood total cholesterol (TC), triglycerides and LDL (The bad, low-density cholesterol) levels and enhance the level of blood HDL (The good high-density cholesterol), as well as HDL /TC and HDL/LDL ratios, at 5% of feed in rats suffering from hyperlipidemia. Cardioprotective Together with Auricularia Auricula's general anti-oxidant properties, Auricularia Auricula polysaccharides shows a strong cardio protective effect, like other medicinal mushrooms such as Reishi and Shiitake.